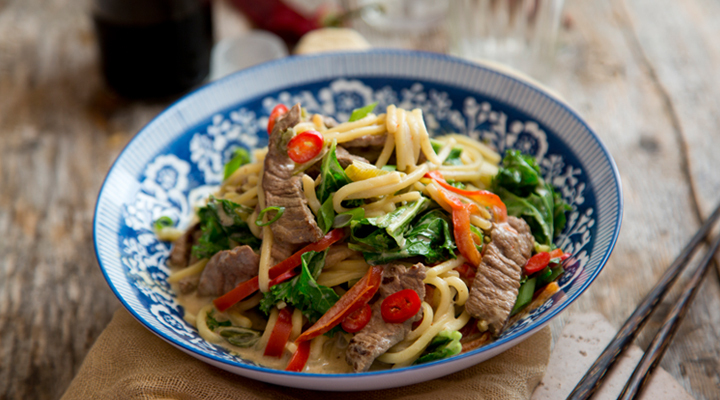 This no fuss recipe makes the perfect, quick, mid week meal. Leftovers can be stored in the fridge and eaten the next day for lunch. First cook the noodles according to the packet instructions. Drain well and set aside. Trim any fat off the beef and discard, then cut the beef into thin strips. Warm the oil in a wok set over a high heat, then add the beef and cook it very quickly, for about 2 minutes. Remove with a slotted spoon and set aside. Add the spring onions, red pepper, garlic and ginger and stir fry for 1 minute, then add the curry paste and coconut milk. Bring to the boil, then reduce the heat slightly and cook for about 5 minutes. Return the beef to the wok, then add the cooked, drained noodles. Roughly break up the kale with your hands and add to the wok. Cook for 1 minute, then serve straight away. Tip: Stir-frying is a healthier alternative to other frying methods, as minimal oil is used and everything is cooked very quickly.